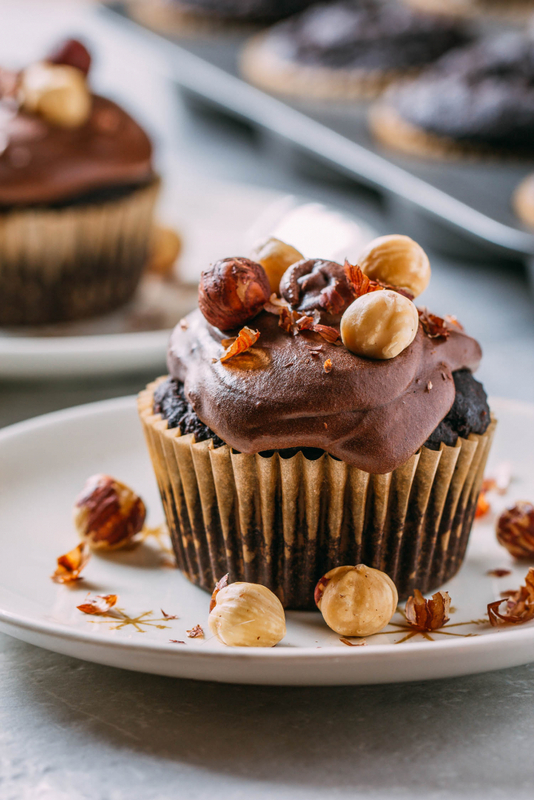 A few short years ago, you could never have convinced us that these Vegan & Gluten-Free Chocolate Cupcakes with Hazelnuts would taste so good that we’d end up wanting them for every birthday. Not to mention we’d also request these for every other special occasion throughout the year, but here we are. Sometimes, chocolate is the only word that needs saying when it’s comes time to describing an ideal sweet treat. This time is no exception other than two or three significant little differences that we can’t wait to share with you! 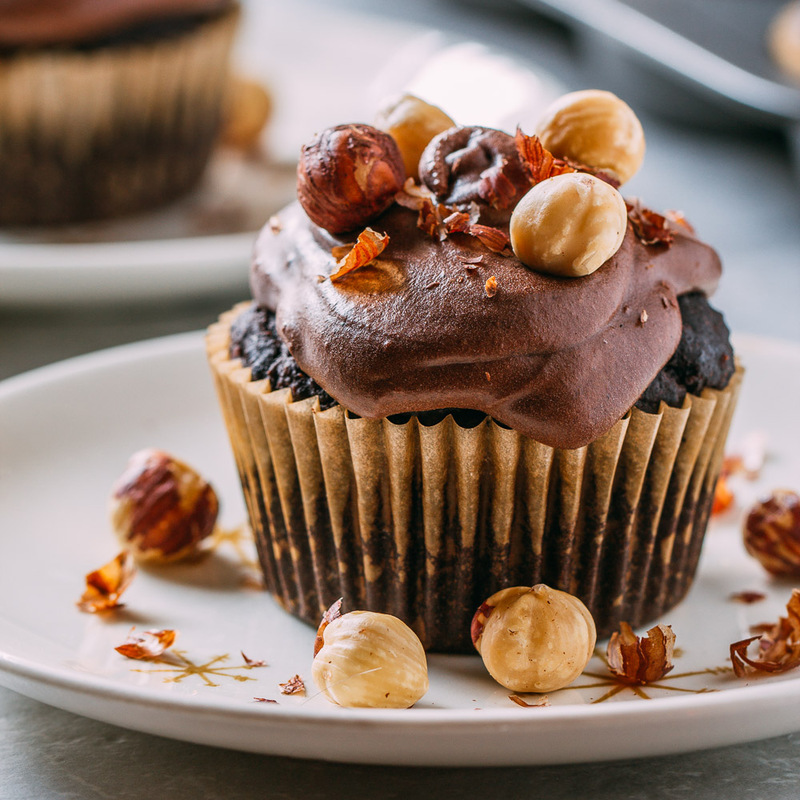 Just as the title describes, Vegan & Gluten-Free Chocolate Cupcakes with Hazelnuts are both vegan and gluten-free. If you’ve ever shopped for commercially packaged treats with those two attributes, you know what a rare and powerful combo these cupcakes possess. Next, Vegan & Gluten-Free Chocolate Cupcakes with Hazelnuts are not only vegan but whole food plant-based. That means that these cupcakes are free of all refined and overly processed ingredients. We’re proud to share with you that there are actual nutrients inside each of these delectable confections! 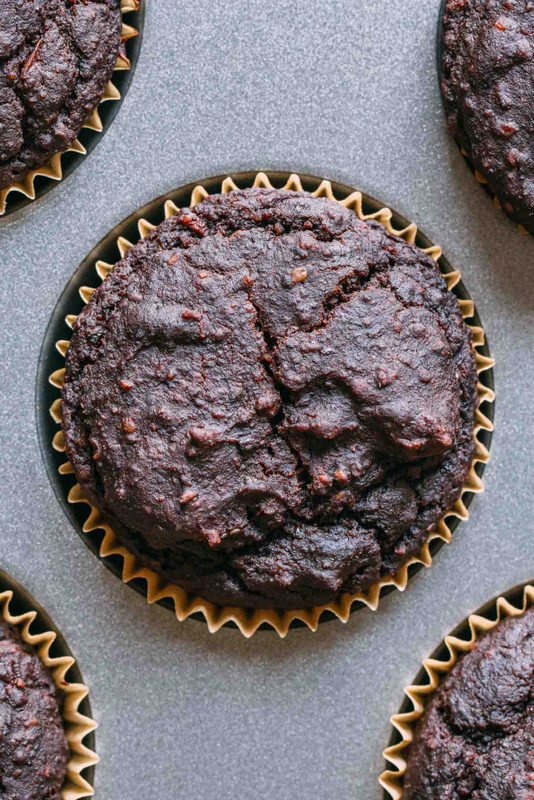 Finally, these cupcakes are both refined oil-free and refined sugar-free. Yes, that sounds an awful lot like whole food plant-based as described in the paragraph above. But think of it this way, it means everything good that was mentioned in the previous paragraph and then some! This cupcake fits the bill for all of the healthy foodies who follow a whole food plant-based oil-free lifestyle. And before you start overthinking the complexities that an oil-free way of cooking might entail, make like a Disney film song and let it go! Oil-free cooking is easy once you decide to stop adding useless oil to everything you cook. 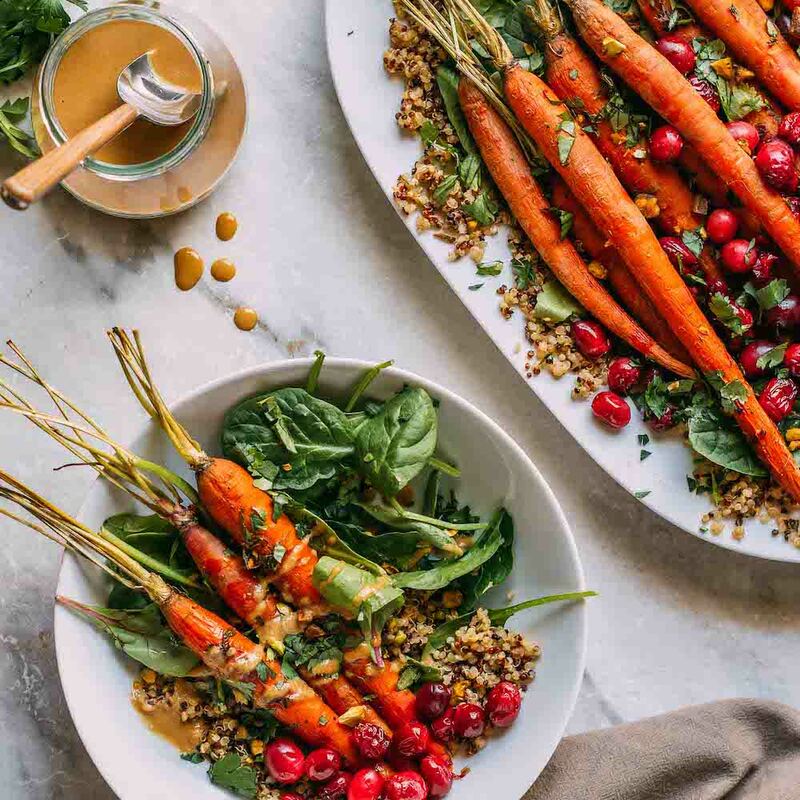 And you might be surprised to know that other than just a couple of our earlier recipes, our entire rapidly expanding collection is not only vegan, meaning cruelty-free. But our dishes are also gluten-free, plant-based and oil-free, too! Cooking oil-free has improved the health of our little family, and between you and me, coupled with the compassionate choices of living a vegan lifestyle, it’s one decision that has increased our joy, tenfold! But enough about all of the obscure little titles and categories of this fabulous cupcake recipe. Let’s talk about where it all started. A few years ago we tried a recipe by Minimalist Baker that we used exclusively until we started reducing oil and using only pure ingredients in our cooking. Now we know that you can mix flours and come up with really delicious gluten-free baked goods. We no longer need to endure nasty gluten-free graininess and flatness. And we’re forever grateful! We’ve been able to learn so much about gluten-free and vegan cooking and baking just by trying different recipes. So, let’s dive into the most important topic of all when it comes to cupcakes, taste! Vegan & Gluten-Free Chocolate Cupcakes with Hazelnuts taste incredibly chocolatey, thanks to the fact that we use rich cacao instead of more processed cocoa. And these GF cupcakes are tender, thanks to mixing the flours which, as we mentioned, we learned from Minimalist Baker! 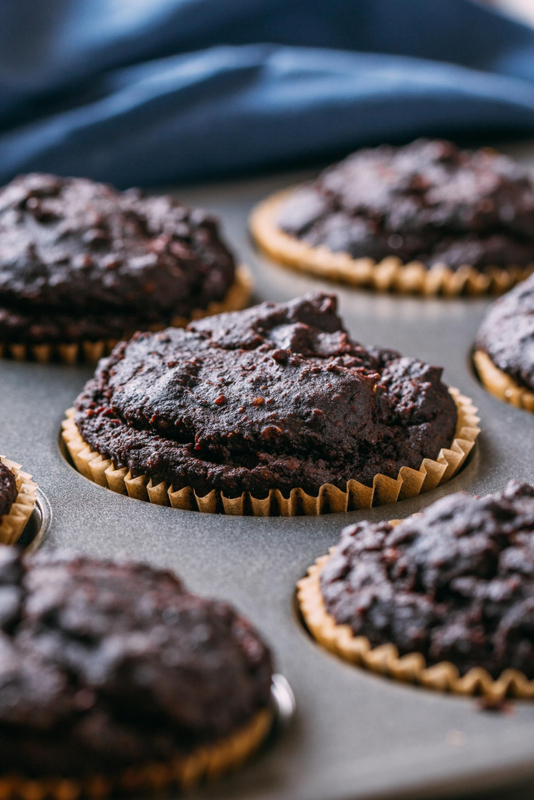 Some cupcakes that are gluten-free tend to taste dry, but not these! Thanks to the tahini there is a perfect level of moisture in every single bite! And what about the frosting, you ask? Well, it tastes like something between straight-up holiday season fudge and the best chocolate bar you’ve ever eaten! For that next birthday, holiday, or heck, even Boss’s Day, or FriYAY – remember this recipe. And whenever you’re looking for that sweet treat to celebrate or impress the best, remember these Vegan & Gluten-Free Chocolate Cupcakes. By the way, you might even want to pour this batter into two round cake pans to make a layered Birthday cale! So go ahead and PIN this keeper recipe. 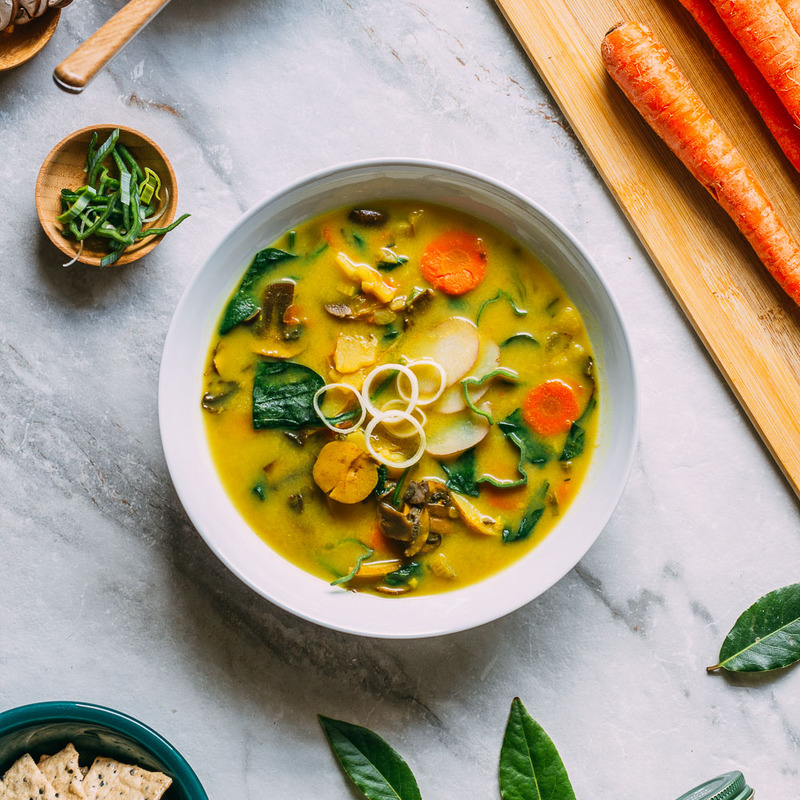 And once you’ve tried it let us know how much you loved it by leaving a kind comment to share your thoughts with others who enjoy cooking plant-based vegan food. With a calendar full of days calling for celebration is it any wonder that we started thinking sweet thoughts and came up with a new version of everybody’s favorite treat, decadent and dreamy, homemade Chocolate Cupcakes? 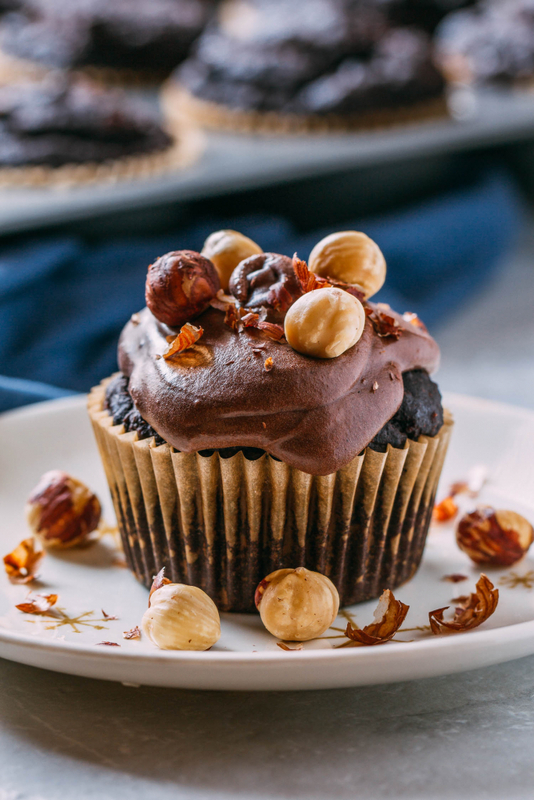 In our recipe for Vegan & Gluten-Free Chocolate Cupcakes with Hazelnuts, we use the very best whole food plant-based ingredients all the way from the bottom of the naturally gluten-free cupcake, straight through the fluffy refined sugar-free fudge-y frosting, all the way to the crunchy roasted hazelnut top! Every bite is as deliciously healthy and gloriously fabulous as a cupcake can get! And if you’re looking for a delicious plant-based drink to enjoy with these cupcakes, we suggest you try our easy 5-Minute Creamy Cardamom Banana Milk! 1 cup of plain, unsweetened plant-based milk - We used almond milk. 2 tsp of apple cider vinegar - We like this brand. 1 cup of apples, ground in a food processor or 1 cup of unsweetened applesauce - Two small apples usually equal about 1 cup of ground apples. 1 cup of oat flour - To ensure your flour is gluten-free, make your own oat flour by grinding raw, old-fashioned, gluten-free oats. 1 1/4 cups of dark chocolate - We use this "Enjoy Life" brand of plant-based, dairy-free, vegan, chocolate chips. 1 1/2 cups of organic maple sugar, date sugar or unrefined coconut sugar, finely ground - You may also opt to use pure maple syrup. 1 or so cups of raw unsalted hazelnuts, as a garnish - We toasted our hazelnuts in the oven while keeping a close watch. Begin by preheating your oven to 350º degrees Fahrenheit and line 24 muffin tins with parchment paper liners. In a large mixing bowl stir briskly or whisk to combine all of the WET Cake Ingredients and set aside to rest for a few minutes. We used a stand mixer to combine the wet ingredients before adding in the dry, but these cupcakes can also be mixed by stirring by hand. In another mixing bowl combine the DRY Cake Ingredients and stir to distribute everything evenly. Add the combined DRY Cake Ingredients to the combined WET Cake Ingredients a little at a time and beat on medium-low with a mixer or whisk by hand to incorporate the wet and dry. Taste and adjust salt, sweetness or vanilla as needed. If the batter looks too thick, add a bit more plant-based milk, but it should be pretty perfect. At this point, you should have a semi-thick batter that’s pourable. If it's thick like brownie batter add that splash of milk mentioned a sentence or so back. Divide your batter evenly between the parchment lined muffin tins. This recipe should be enough for roughly 24 cupcakes filling each to a generously three-quarters of the way full. 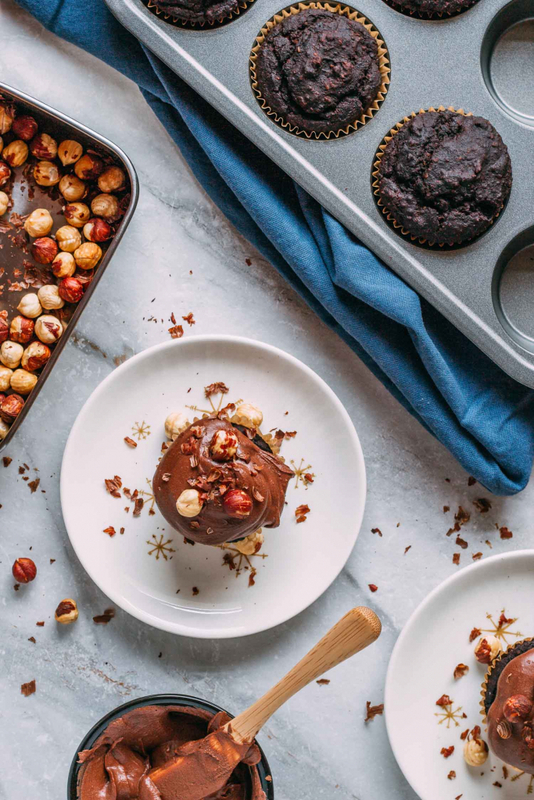 Note: To roast the hazelnuts, place them in a small baking pan and bake in the oven for a few minutes while the cupcakes bake. 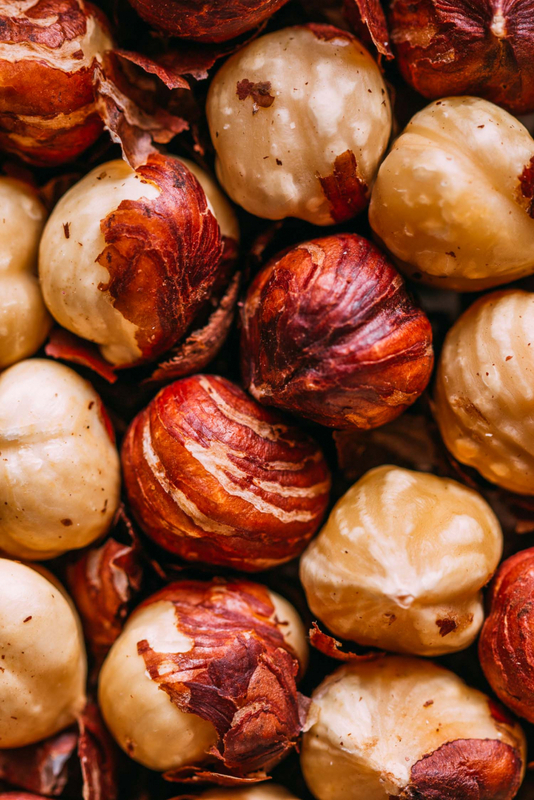 Do not leave the hazelnuts unattended... they'll roast quickly, and they're done once their aroma fills the air! Bake your cupcakes for about thirty to thirty-five minutes or until a toothpick inserted into the center comes out clean and the top of the cupcake looks dry. Allow the cakes to rest in the baking pan for about fifteen minutes before carefully moving each cupcake onto a cooling rack. Allow the cakes to cool completely before frosting. In a small saucepan or a heat-safe mixing bowl, warm the unsweetened plant-based milk for a minute or so. If you're heating the milk in a pan on the stovetop, cook it until simmering and then pour it into a heatproof mixing bowl. Add the chocolate chips to the warm milk immediately and leave it undisturbed for three to five minutes so that the chocolate can begin to melt. After the milk and chocolate have sat untouched, stir to incorporate the two ingredients and then add the tahini and cover. Let the mixture rest undisturbed for about ten minutes. 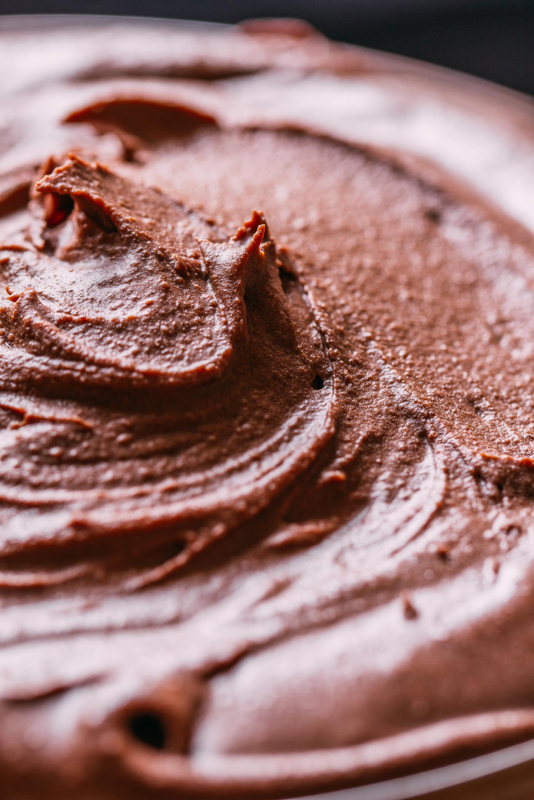 Once the melted chocolate and tahini combo have rested, use a mixer or a whisk to beat the mixture together. We used a stand mixer. Then add one-half cup of the sugar, mix again, and repeat until all of the sugar has been incorporated. Place the frosting in the fridge to firm up for ten to twenty minutes. Note that if you've opted to use maple syrup as the sweetener, your frosting might remain a bit more or the pourable side rather than stiff. Frost the cooled cupcakes and add roasted hazelnuts to the top of each cake. This recipe can also be made into a stacked layer cake or a single layer cake when you adjust baking times accordingly. Your cupcakes will taste phenomenal when eaten fresh. But if there are any leftovers, they will keep well at room temperature for several days. Refrigeration is a good idea when keeping for days on end. Freezing unfrosted cakes work well when you need more extended periods of storing. Either way, be sure to cover these little lovelies in an airtight container when stashing away for another day. FOR THE FROSTING: Organic maple sugar, date sugar or unrefined coconut sugar are our first choices for this frosting, but they may need to be ground down a bit in a spice grinder or food processor if you want the frosting to feel super smooth. Maple syrup works well too, but we prefer the little bit of texture added by the dried sugars. Using organic powdered sugar would not require additional grinding, but it is more of a processed sugar even though it is likely to be vegan. FOR THE FROSTING: We found that adding 1 1/2 cups of finely ground sugar was pretty perfect and barely even needed a few minutes in the fridge. But if your frosting is too runny after time in the fridge, add another 1/4 - 1/2 cup of sugar and beat it again until light and fluffy. Thank you for a chocolate cupcake that isn’t loaded with oil. 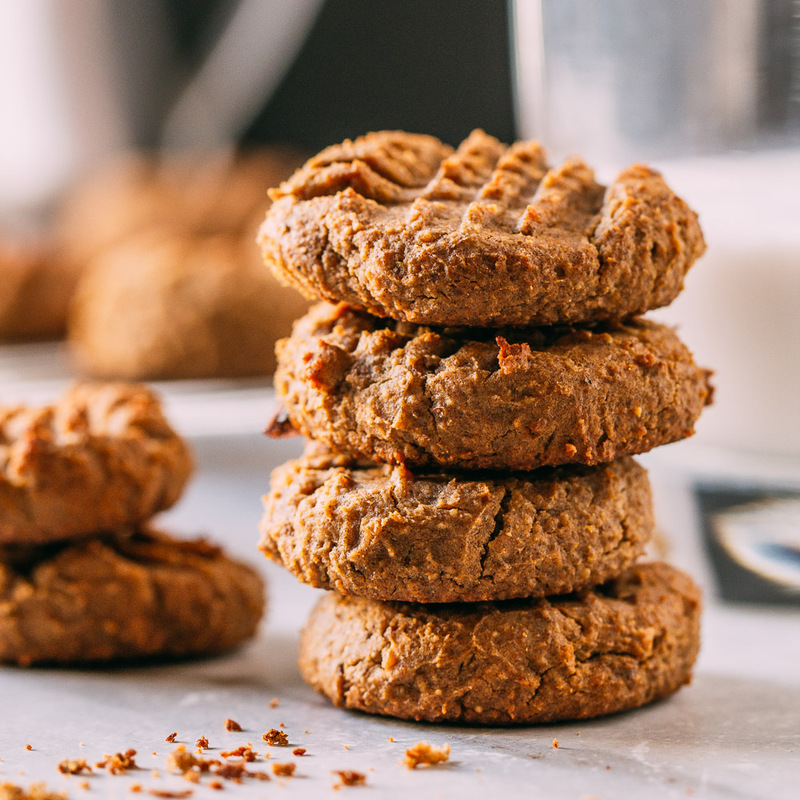 I’m allergic to almonds — so can’t use almond flour. Can I just increase the oat or gluten-free flour? I have cashew meal, too. Would that work? Thank you for your kindness, Liz. Though I haven’t tried this recipe without the almond flour, I do think that subbing out the almond flour for either the cashew you mentioned or increasing the oat flour, would work out well. I would try those options before just adding more gluten-free flour – sometimes GF blends can feel heavy, depending on the brand. Thank you for reading and for asking… I’d love to hear how it goes! This is awesome! So many vegan sites have oil in their recipes and refined sugar! Oh! I just saw the oatmeal chia banana bread! I have a couple ripe bananas calling. I better go answer the call. Thanks!!! So glad that you are enjoying our take on plant-based vegan recipes, Beth. And thanks for noticing the lack of refined sugars and such in the ingredients. Would love to hear how your banana bread turns out; that recipe is one that is on constant repeat around here. Who knew we’d all be wishing for our bananas to go spotted, quickly, right?